Good evening and thank you for giving me the opportunity to speak with you again. I was glad to read that Dr. Shelton described his first year as Fayette County Superintendent as a “year of observation and learning”, the second was a “year of planning” and the year to come “will be a year of action and implementation.” One of the things I hope you will take action on is strengthening the district wellness policy to include not using food as a reward, healthier celebrations, healthier fundraising, and physical activity. In January, a community partnership made up of members from the American Heart Association, Lexington Health Department, Alliance for a Healthier Generation, and Tweens Nutrition and Fitness Coalition presented our recommendations for strengthening the district wellness policy. We are getting ready to start another year and these recommendations have not been adopted. This means some students are attending schools with strong wellness policies while others are not. This leads to health disparities as well as achievement gaps because research shows healthy students make better learners. For example, I gave you a copy of the supply list from Sandersville Elementary which suggests parents of Kindergarteners should send in bags of candy. This means another group of students and their families are getting the message that this is an appropriate method for teaching children. Teachers are a trusted authority. Parents and students look up to them. If they support using food as a reward, why wouldn’t families? Places shape health: where we live, work, learn and play. Policies and practice shape place. 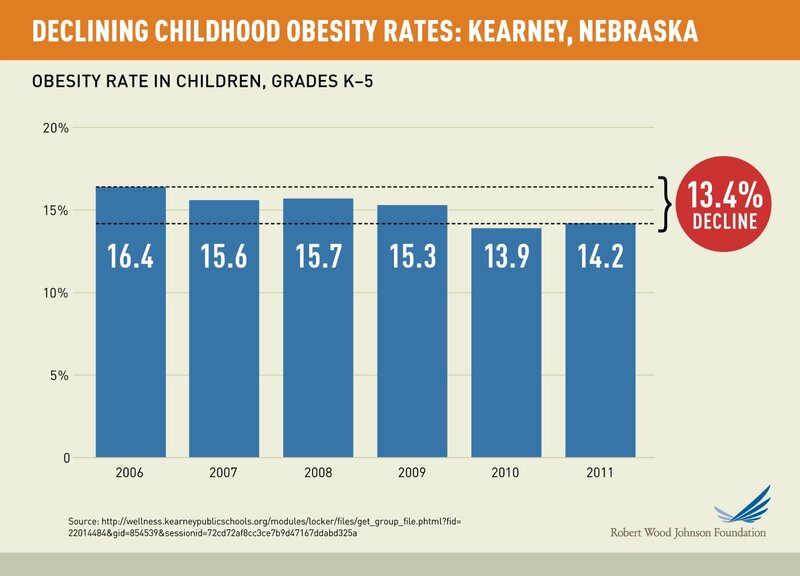 A good example is Kearney Nebraska which you can see on the graph had a 13.4 percent decline in childhood obesity in just five years. During this time, many of Kearney’s efforts to promote healthy weight for children were based in schools. The Kearney Public Schools district adopted a wellness policy in 2006, hired Wellness Coordinator Cari Franzen to lead its implementation in 2007, and then joined the Alliance for a Healthier Generation’s Healthy Schools Program. Heelan and Franzen also brought the case for a healthier school environment directly to teachers, who embraced strategies to make their classrooms healthier, such as replacing snack-based rewards with extra recess time. This is a college and career readiness issue since 25 percent of young people are ineligible to join the military due to being overweight. 80 percent of military recruits who initially flunked their weight test didn’t complete their first term of enlistment. We are closing the door to $1 billion in scholarships through the military as well as closing the door on future career options including law enforcement, paramedics and firefighting. I was able to graduate from college without crushing student loan debt because of my military service and students in Fayette County should have that same opportunity. It impacts more than just their career options. A new study shows obesity is even deadlier than previously thought. Between the ages of 40 and 85, about 18 percent of all deaths could be associated with high body mass. This may get even worse since there’s now a whole generation of Americans who have been obese from childhood and will be obese their whole lives. 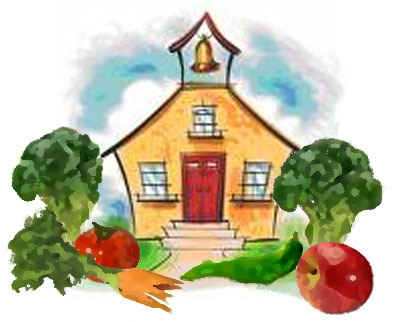 Two recent studies highlight the importance of good nutrition in schools. The first study linked soda to behavioral problems in young children. Public health researchers looked at thousands of 5-year-olds, and found the more sugary soft drinks they consumed, the more likely they were to inflict damage and hurt others. The second shows diet matters to mental health. The results, published in the Journal of the American Academy of Child and Adolescent Psychiatry, show mothers who eat badly have a higher proportion of children with behavioural problems such as tantrums and aggression. They also show children who eat too much unhealthy food or too little healthy food have these symptoms as well as depression and anxiety. Please make this a year of action and implementation for a strong school wellness policy. Thank you. Tags: Alliance for a Healthier Generation, Healthy, School Wellness Policies. Bookmark the permalink. Previous post ← What’s Worse Than A Woman in a Cupcake Bra Shilling Soda to Kids? I’ve said it before and I’ll say it again, it’s so nice to know you are representing my beliefs. I’m not as equipped with knowledge and facts as you are, but I’m just as passionate. I really do appreciate all that you do for our kids. If there’s ever a way I can help, please don’t hesitate to ask! Thanks Danielle and I sure do appreciate the support! Well said! You can’t argue with the facts and statistics. Thanks for being an advocate for kids’ health, Casey! You’re welcome and thanks for the encouragement!